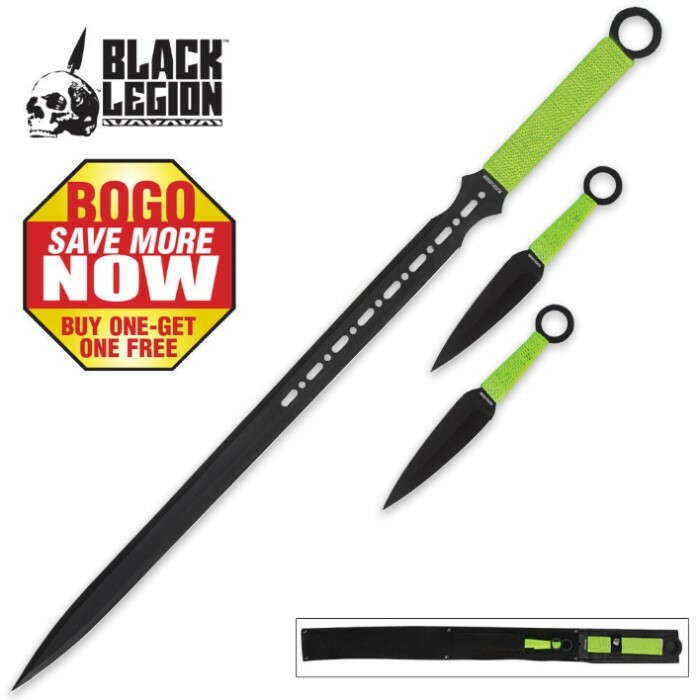 Zombie Apocalypse edition of our Dual Attack Ninja Sword with bright green cord wrapping. This Ninja combo combines two critical weapons for every Shinobi warrior's arsenal in one convenient and mobile package. A trusty double edged sword and versatile kunai knives. The tempered 440 stainless steel sword blade comes complete with center cutouts and a ring pommel. Full tang, the blade has a two tone black and satin finish. The handle is cord wrapped to provide a secure grip. The set of two kunai knives are suitable for both throwing usage or as close quarters daggers. Each kunai is forged from one piece of steel and features a cord wrapped handle. All three of these weapons fit neatly within one nylon sheath. Each kunai knife has its own compartment on the sheath, and a back strap is included for easy carry while on the move. I love this! deffinetly worth my money! This is A amazing sword!!! !